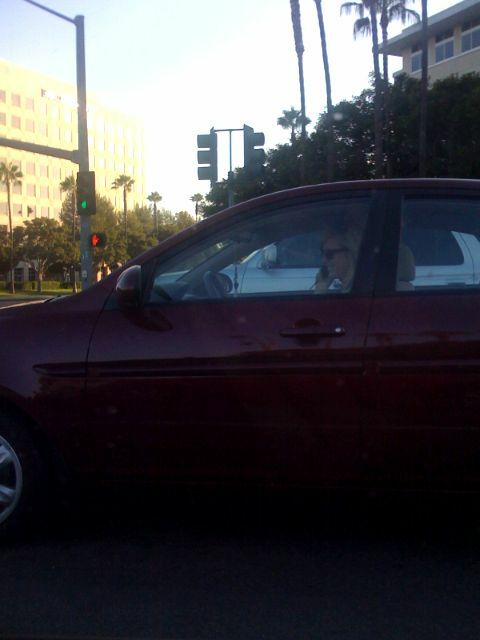 I saw this today… This OC woman had the nerve to talk on her cellphone while driving…we drove four blocks next to her, there was yelling, and knee slapping laughter. I don’t know, it annoys me. I don’t approve of the law, but it irks me that the really “OC” people are so obvious. A few of us decided to take a day off today (Wednesday) to go to Universal Studios Hollywood before our $20 coupons expire. 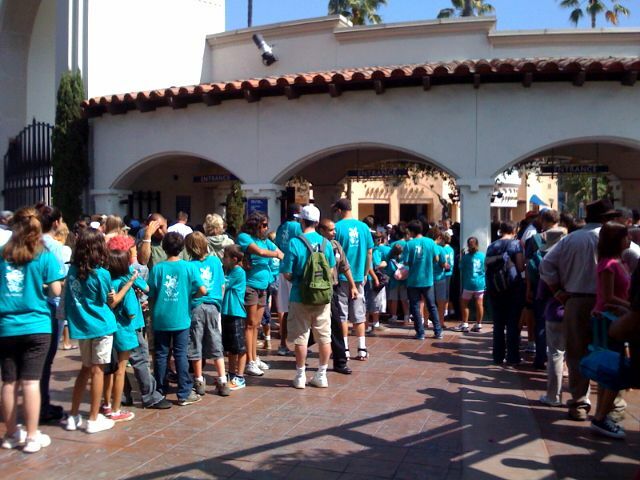 We thought it was a good idea being the middle of the week, all the kids that were on summer vacation would probably be at Disneyland or Six Flags Magic Mountain….Nope we were sooooo wrong, the place was packed like a can of tuna! Children EVERYWHERE! I came to a realization that I need to seriously lose some weight, I’m not fat, just no longer fit like I was back in the good ol’ swimming days. I used to out eat everyone and not gain anything but muscle because I swam four hours everyday for two teams. Now I can still out eat everyone I know, but working in an office 12 hours a day really doesn’t help it, especially when the only exercise I get is turning my head from one monitor to the next (I have 3 24″ LCDs for work). I don’t eat a lot unless it’s a bet or dare. I have noticed that I’m not too comfortable with my belt at the same notch it used to be (yes I have belts that old)…I have not changed my pant size, not can I comfortably move to the next notch on my belt (maybe 1/2 a notch). Starting this weekend I’m taking my road bike out for at least 30 miles on the weekends, I hope that helps (it’s too hard to rush home after work and ride). wish me luck! I’m not sure how much it would help if I work out for two days and stop for five…..I need to work less. When I’m “blogging” I’m just typing things as it comes into my head, at this point I go well over 100wpm, I never said I typed correctly at that speed. I recently got a message from a user from another forum saying “why don’t you learn to spell, your a idiot” that’s the exact phrase. Second, if you are going to call me an idiot, learn to do it properly because it’s “you’RE”, not “your”, and it’s “AN idiot” not “A idiot”! I try to type correctly, but it’s really weird proof reading what you wrote when it’s a blog that is really not meant for the public, it’s just for venting. I do check everything if it’s work related, for this….not so much. So please excuse me if I sound weird on here, it happens, now shut up and read on. I got an old IBM ThinkPad from work (PIII, 800Mhz, Windows 2000), They were actually going to throw it away, it had dead 20GB HDD, no ram, no power adapter and a dead battery. I took it home, went on eBay and bought a battery ($20), power adapter ($10) and a SECOND battery ($35)that fits into the “Ultrabay” where the DVD/CD/Floppy optical drives is supposed to be. I put in two sticks of 128mb of pc100 ram that I had from like 10 years ago (this laptop maxes out at 512 but I didn’t feel like I would need it for this old thing). I put in an old 40GB Toshiba hard drive I had pulled from an old laptop in college. Installed Windows XP and all my usual software and utilities. $65 dollars and 4 hours later, I was up and running. The laptop was definitely abused by the previous owner, it had a few blemishes, the LCD had minor but annoying pressure points from either fingers poking at it or keyboard pressure. for $65 dollars I had a new IBM ThinkPad that cost $3000 7 years before. Yes, it is old and underpowered, but I have 7 other computers at home, power is not what I was looking for, I was looking for a piece machine to sit back with on my recliner in front of the TV. With the Ultrabay battery, this is definitely the machine to do so. I had tested the two batteries in the laptop, I got over 6 hours of active use on it with a medium bright screen, with a PCMCIA Wifi card on! When tested it, I noticed that the battery monitor said this (2 hours into use)….89% battey, 10:11 hours left. of course that’s wrong because I got the battery critical alert at 6 hours 12 minutes, but I’m still very impressed! I don’t think I can get this kind of battery life on my newer 2Ghz Thinkpad! There’s an advantage for this little underpowered machine after all! I sold $765.25 worth of stuff on eBay recently and only got $699.18, the more I sell the more I feel ripped off. PayPal (the company that allows people like me to accept online payments from other people) is owned by eBay. I have to pay a listing fee to eBay when I list and item to sell, then when it ends I have to pay a percentage of the sold value to eBay. When the buyer pays me through PayPal, PayPal gets a percentage of that! I’m getting poked from three sides! There’s nothing I can do, but I have no idea how this is even legal! grrrrrrr.